Terry Bozzio Drums is a new high-definition SampleTank 3 instruments collection. It includes a huge 1.7 gigabyte library with more than 1,800 drum kit samples and 350 meticulously recorded loops. 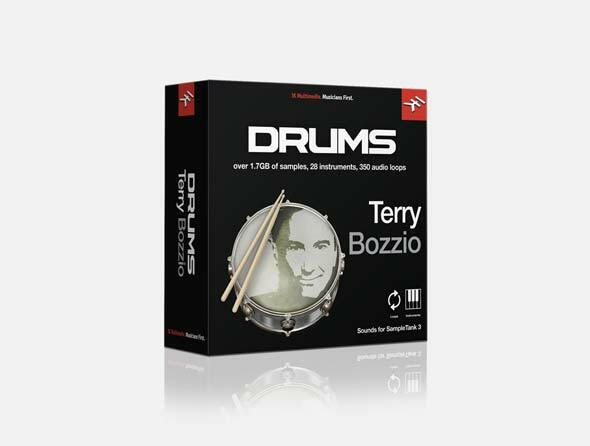 All of these sounds have been played by Terry Bozzio, the idiosyncratic drummer whose incendiary performances with Frank Zappa, UK, Jeff Beck and Missing Persons span 4 decades of classic album appearances. Terry Bozzio is known for his massive drum kits and uniquely melodic playing style. With Terry Bozzio Drums, we've gone to great lengths to ensure you feel like you're sitting in his drummer's throne: You get 16 playable drum kit instruments with a complete kit that includes 2 kick drums, snare with multiple articulations, 6 highly stylized Roto Toms (each played with 4 articulations), hi-hat and several unusual and exotic percussive elements that include things like china cymbals, stacked cymbals and more. And for the ultimate realistic playing experience, all of the kit's drums have been recorded at 8 different velocities with as many as 8 round-robin hits per velocity! 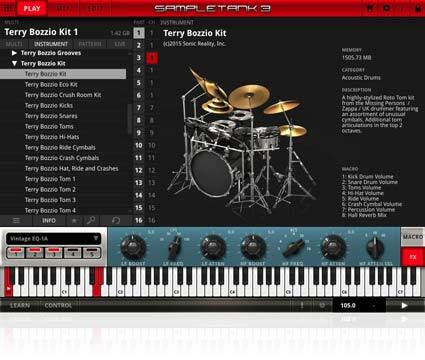 The drums are mapped using an extended General MIDI mapping so you can mix-and-match kit elements from the Terry Bozzio Drums collection with elements from other SampleTank 3 factory drum kits or from other SampleTank 3 instruments collections available in the Custom Shop like the Neil Peart or Billy Cobham kits. 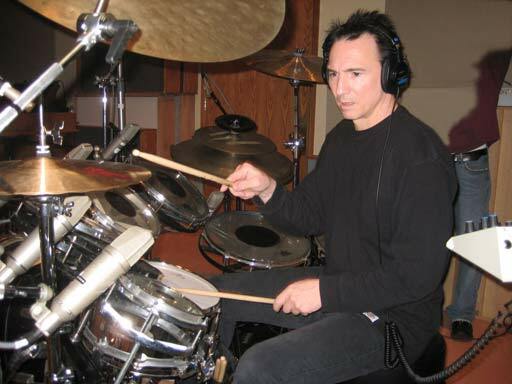 Terry Bozzio Drums also includes 350 audio loops played by the man himself. All of these have been organized into 12 instruments, and they're all in the style of many of his favorite album cuts. And because of ST3's S.T.R.E.T.C.H. engine, you can instantly change the tempo of these loops without altering the pitch. You can even mix these killer loops with one-shot samples played via MIDI to create ultra-realistic drum tracks and truly natural sounding rhythms.